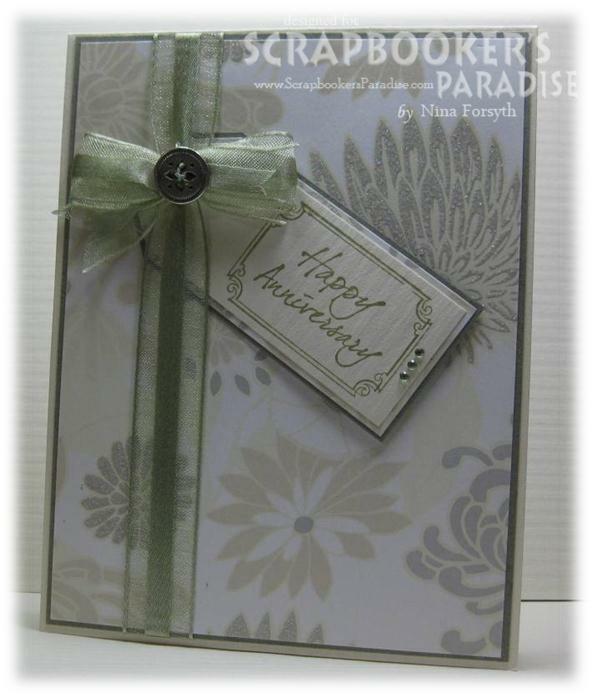 Happy Friday, I am hosting over at Scrapbooker's Paradise Ponders for the Playing in Paradise challenge. We would love for you to come join in the fun. 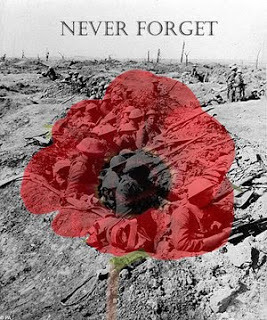 There are alot of men my family and it seems that there is always someone in need of a card. It helps that I find them easy to put together. 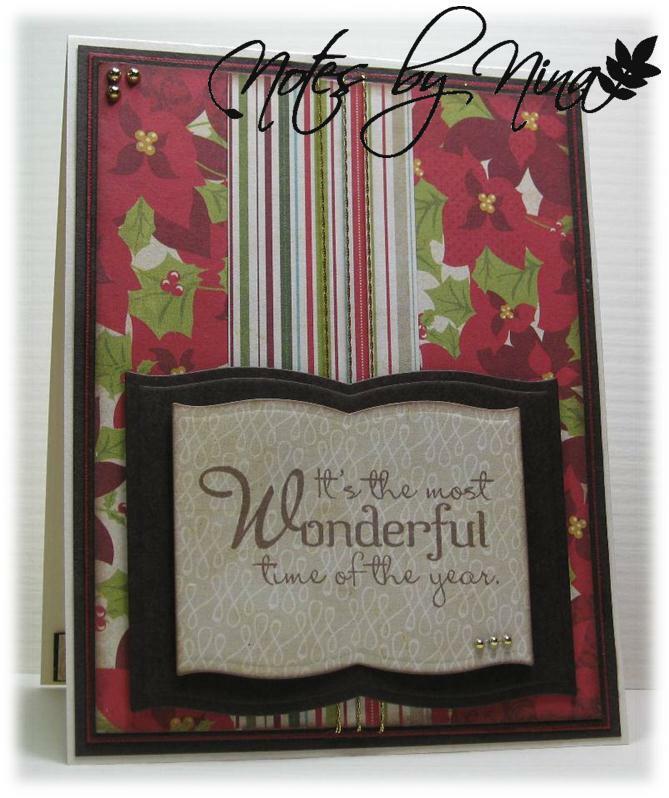 I have a ton of embossing folders and I love to use them. 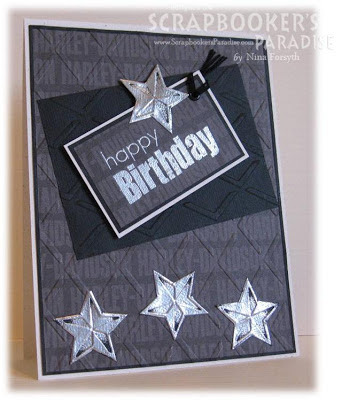 Since masculine cards are usually pretty basic texture can add dimention to a card. I used a embossing folder for the stars then cut them out and heat embossed them with silver. I added texture to both the background and the black panel. I heat embossed the sentiment and popped it up with foam tape, I finished with a eyelet and some twine to make a small fring. 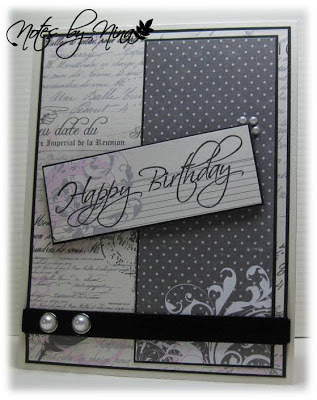 Supplies: Natural white and black cardstock, Designer Paper-, embossing folders and twine. Stop by the Scrapbooker's Paradise Blog to see what the challenge team has created and join in the challenge fun. Christmas is getting closer :). We picked up the cutest little Christmas tree from Michaels this weekend, one of those pre-decotated ones they have for floral displays. It was 50% off and so we could not resist, my husband and I are treating ourselves to a trip over the holidays so we are not decorating the house like we normally would. 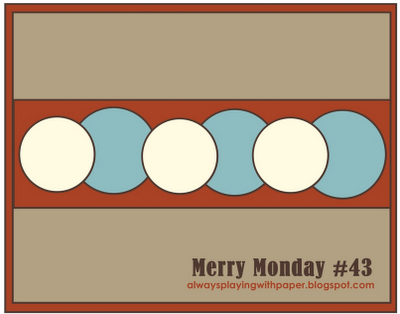 We have a new Merry Monday Challenge this week. I have to admit it took me a couple of tries with this card to get what I wanted. I am very happy with the finished card. I cut the little trees out of my DP scraps and inked the edges. I added some little gold pearls to the tips for added embelishment The strip behind is embossed and added a little twine. 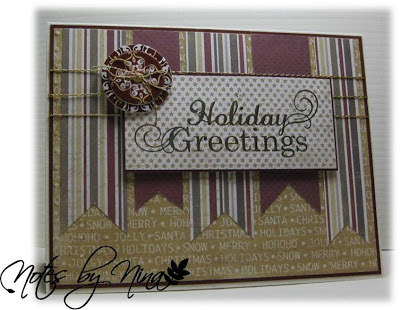 Supplies: Cream and burgundy cardstock, Designer Paper –Fancy Pants, Verve-Holiday Phrases, embossing folder, gold twine and pearls. Head over to Always Playing with Paper to see what Lesley and the Design Team members have created, we would love for you to play along with us for Merry Monday. 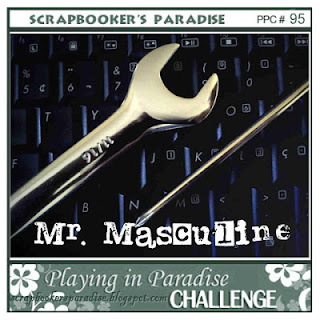 Happy Friday everyone, we have a new Playing in Paradise challenge for you today and Merle is our hostess this week. This week the challenge is all about colour inspiration. I always struggle a little with colour challenges, so I tend to try to find DP that includes all the requirements then work around it. I was pleased that this Simple Stories DP had exactly what I was looking for. I heat embossed the flowers then cut them out, they are popped up with foam tape. I also heat embossed the sentiment them matted it. I finished with a little twine and a button made with punches. 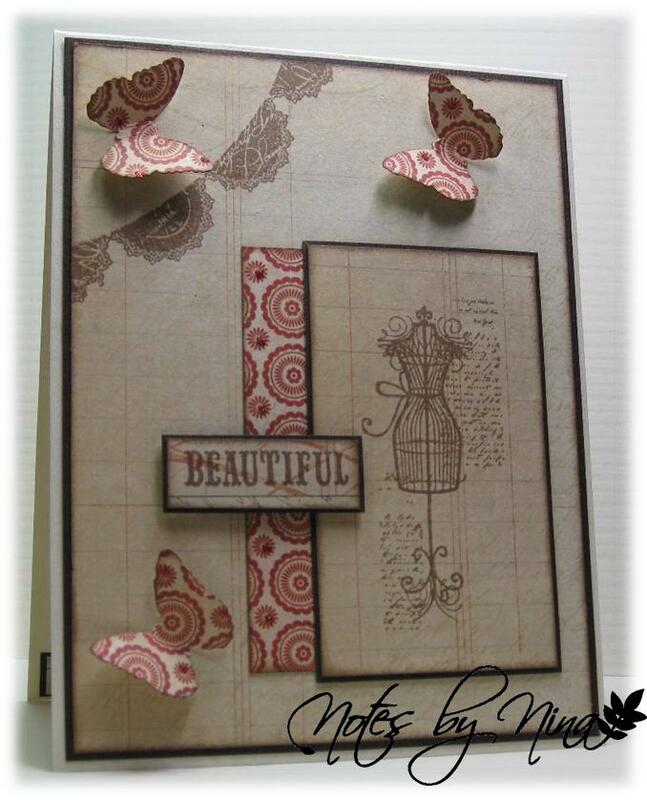 Supplies: Cream and brown card stock, Designer Paper-Simple Stories, The Stamps of Life, misc twine, pearls. 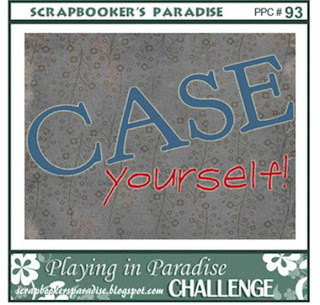 Don't forget to stop by the Scrapbooker's Paradise Blog to see what the challenge team has created and to join in the challenge fun. Happy Monday everyone, it is time for another Merry Monday, Lesley has a wonderful new sketch for us. I tried to keep my card on the simple side, so I did not layer the flags. I heat embossed the sentiment then popped the panel up with foam tape. I pulled out some chipboard button from way back and layered them. I also managed to sneak some gold twine in. 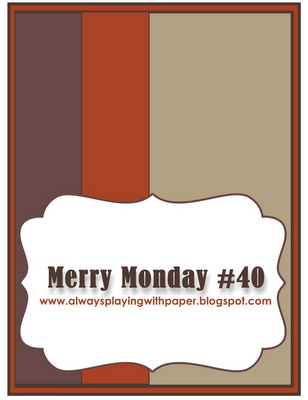 Stop on by Always Playing with Paper to see what Lesley and the other Design Team members have created, we would love for you to play along with us for Merry Monday. Supplies: Cream and burgundy cardstock, Designer Paper –Carta Bella, TPC – Simple Stick, twine K&Company buttons. I had so much fun making this card, there is always a little extra challenge with a themed card. One of my best friend's has a young daughter with a birthday coming up. 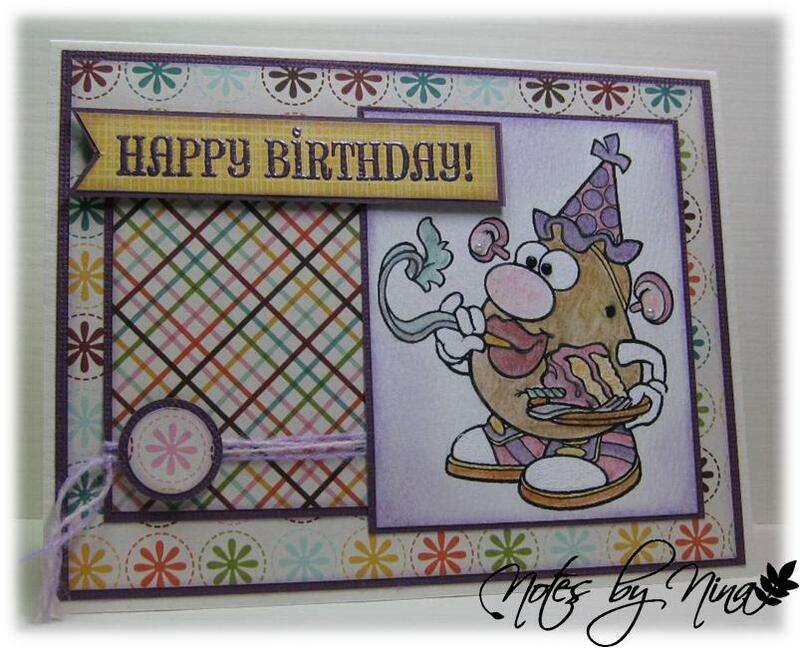 She asked for a Potato head, so I could not resist making a card to match. I used the card I made earlier this week as a guide (Tuesday Morning Sketches). I first found a coloring page for Mrs. P then coloured her with a mix of watercolor pencils and Pearlescent watercolour paints. I used a white jelly roller for the eyes, arms and tips of the running shoes. I wish this picture showed the glimmer of the Pearlescent watercolours better. In all the pictures I have seen, she dresses with pinks and purples, so I matched the DP to the coloured image. I added some wool twine and a heat embossed sentiment, I should have added a pearl to the little button but I did not think of it at the time. I finished with adding some pearls to her eyes and a couple in her ears for earrings. Supplies: Cream and purple cardstock, Designer Paper –Echo Park, Mrs. P-colouring pages, twine and pearls. It's Friday and that means there is a new Playing in Paradise challenge and Angela is our hostess this week. The challenge is to 'Case Yourself". For all the wonderful details visit the Playing in Paradise challenge blog. 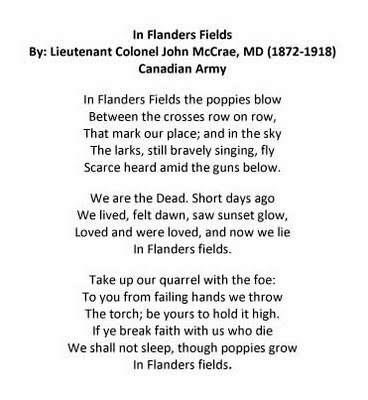 The card I cased is from the post HERE. I liked the CAS look and it was fun to make. I have to admit that I dug a little deep to find my supplies. I saw this DP as I was searching for something specific and it caught my eye and it was perfect for this card. I added a little texture to the strip backing the twine, I hand cut the heat embossed flower and finished with a sentiment and a Hero Arts dot. 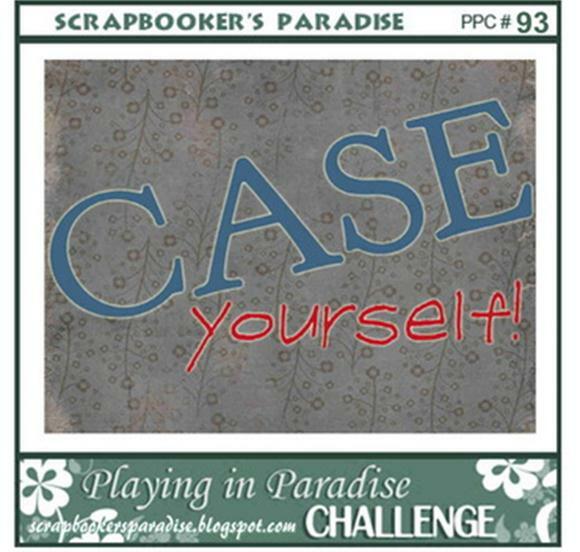 Don't forget to stop by the Scrapbooker's Paradise Blog to see what the challenge team have created and to join in the challenge fun. Supplies: Cream and brown card stock, Designer Paper-My Mind's, The Stamps of Life, embossing folder, misc twine, Hero Arts dots. I can't resist posting this silly card I made for my son, he moved out on his own this past weekend and I wanted to send some mail to his new address. I figure with almost a week gone by he is missing the 'free' food so I put a gift card for the local grocery store inside. I have had this designer paper for a while and I thought it was fun enough to produce a smile when it is opened even for a young man. I cut out one of the frogs and popped it up with foam tape then added some googly eyes. I printed the sentiment off the computer and finished with some twine and buttons made with circle punches. Supplies: Natural White and black cardstock, Designer Paper-Basic Grey, twine, googly eyes, gems and misc gems. I has a little time to made a card this evening, so I took a peek at the new Tuesday Morning Sketches challenge. I have a couple packs of new stamps sets from the Stamps of Life on the corner of my desk and I was determined to used them and this little bee was perfect. I added some texture to the back ground, then created a couple of panels. 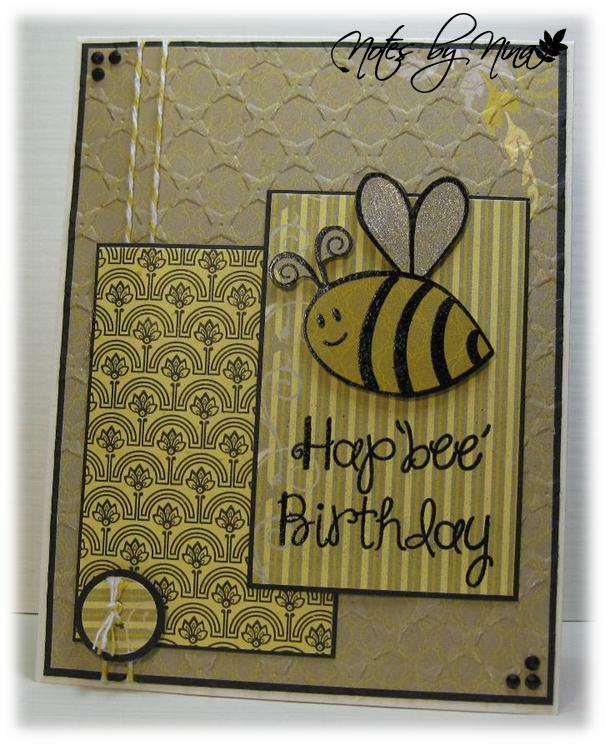 I heat embossed the sentiment and the bee. I cut the bee out them mounted it on foam tape before adding some clear star jelly roller to the wings. I finished with some twine, gems and a button made from punched circles. So I managed to get the sketch right.. sort of :) but I am pretty sure fussy cutting does not make the grade for punch art critter, but it certainly is cute. 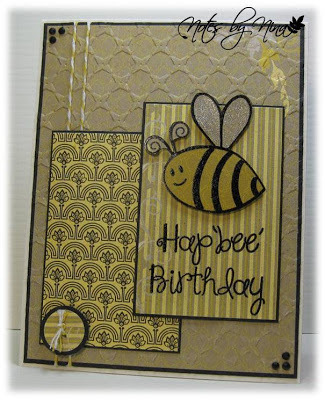 Supplies: Cream and black cardstock, Designer Paper –Bo Bunny, The Stamps of Life-bee4me, misc punches, twine and gems. 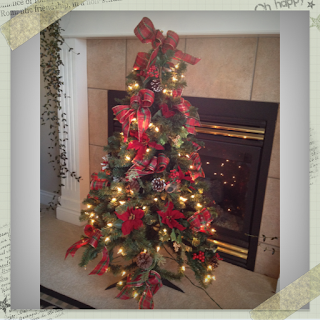 Christmas is getting closer, every week the decorations that are going up everywhere seem to get more elaborate. I have a hard time thinking about putting anything out before Dec 1, but that does not stop me from having a new Christmas card on display every Monday :). There is a new sketch for this weeks Merry Monday Challenge. I used my lonely little Slice for the holly, then heat embossed the berries with Red embossing tinsel. 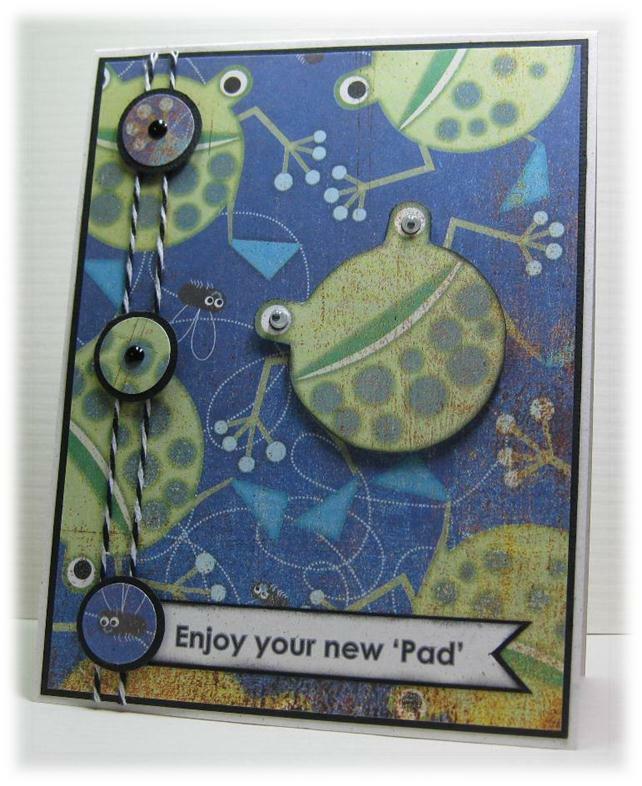 The rest of the card is basic layers, and the sentiment and circles are popped up with foam tape. The sun is shining and it is a beautiful fall day here in Victoria today. I have had a great week with even a little birthday magic thrown in but I am happy that it is Friday. We have a new Playing in Paradise Challenge for you today, and Allison is our hostess this week with one of her fantastic sketches. 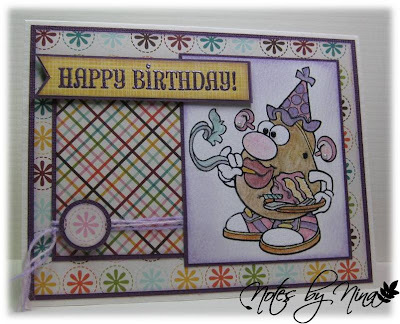 It took me a few tried to get the look I wanted with all my elements but in the end I like the earthy look to my card. I added some Stickles to my tree, and dipped the little butterfly in glue and sprinkled with glitter and added a couple of pearls. Supplies: Cream and brown card stock, Designer Paper-My Mind's,KanBan-Spring Silhouettes, punches, Stickles, Spellbinder diecuts, Fairydust glitter, ribbon, pearls. 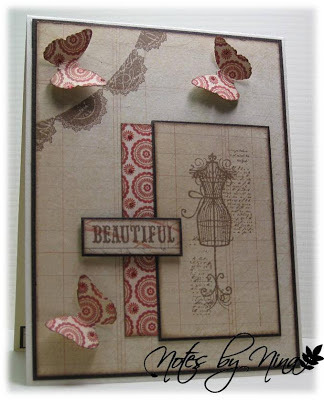 Don't forget to stop by the Scrapbooker's Paradise Blog to see the challenge team's sample creations and to join in the challenge fun. 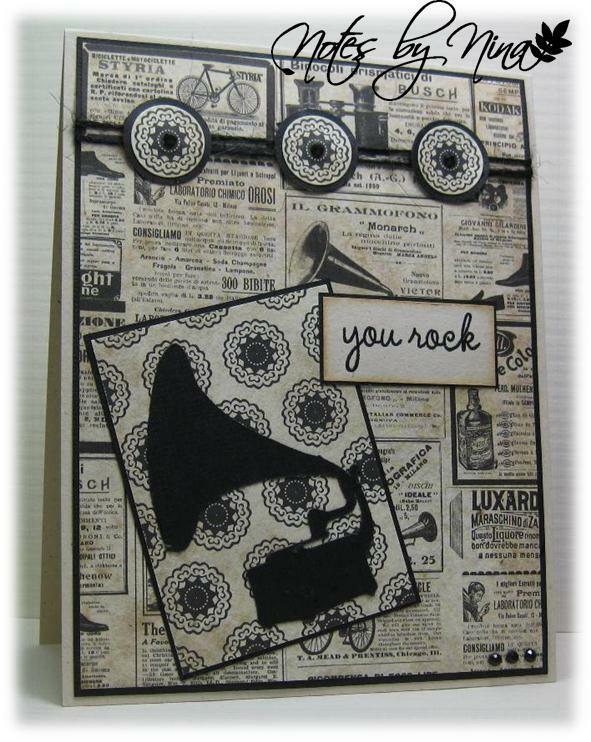 My sister Barb had a hankering to create a card with a gramophone last night. 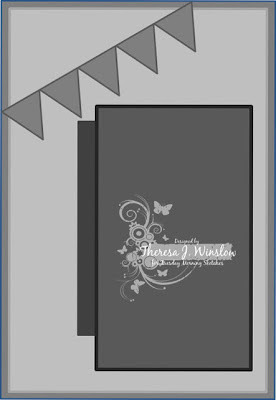 To get to that point though she created her own wonderful .svg cut so that she could use it with her Silhouette Cameo. 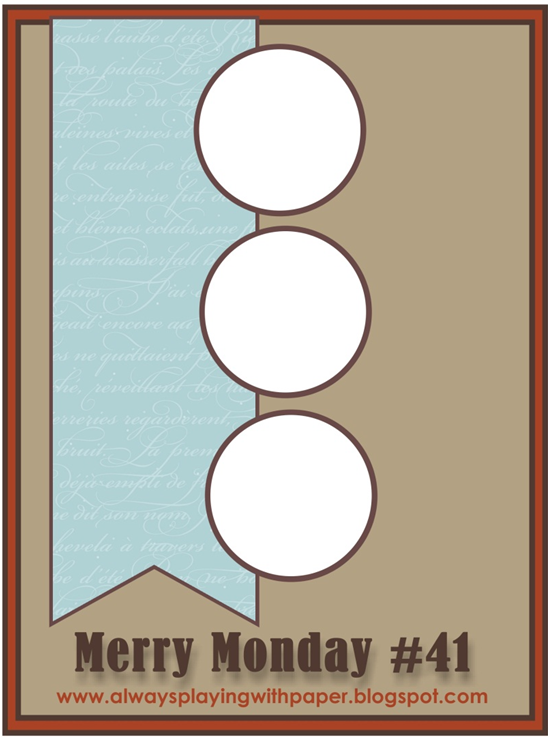 I am the first to admit that my Cricut and Slice mostly sit unused, but I promised that Cricut would be dusted off to cut this element out so we could make a card together. It aways make me smile when I see how different our cards turn out when we tackle a challenge at the same time. I could not resist using my Echo Park paper that already had vintage style items on it, including a gramophone (If you look close you can see it peeking out from behind the pane). It took me forever to put all these pieces together, it did not matter how I placed them it seemed off. I finally added the twine and circle elements first then added the rest. You can find this fantastic Gramophone .svg file on Barb's blog HERE. 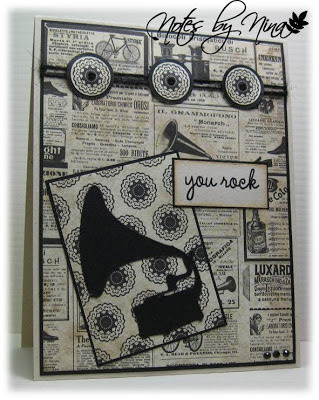 Supplies: Natural Ivory and black cardstock, Designer Paper-Echo Park, The Stamps of Life-tinytitles2stamp, Barb Derksen - Gramophone .svg cut, twine, gems, and misc punches. 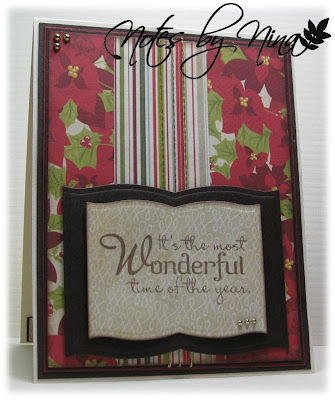 Whew it is going to be a quick post tonight, I just finished my card and I am determined to post it tonight. 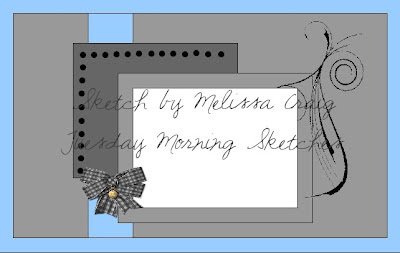 I created this card for the current Tuesday Morning Sketches. I love how simple this sketch is. 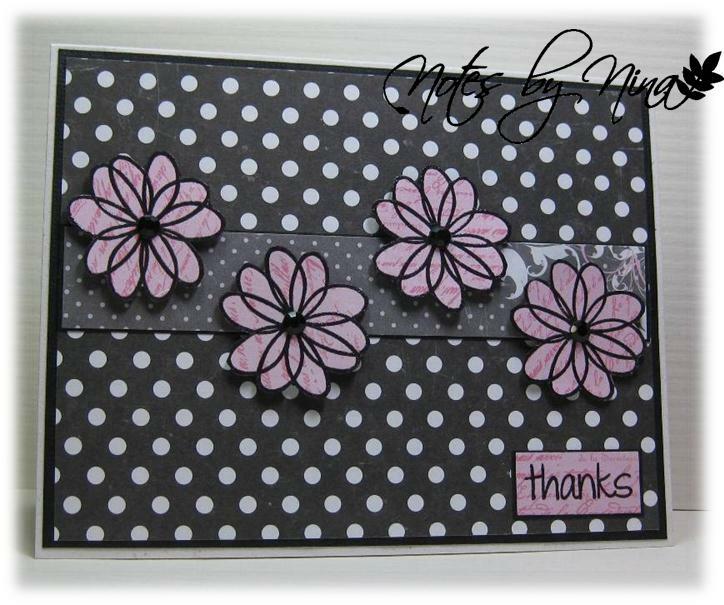 I stamped my flowered them heat embossed them in black. I cut them out by hand then edged them with my black Tombow and popped them up with foam tape. I finished with a gems. I am off to bed, spin class drained me of energy... comments will be made on the morrow :). 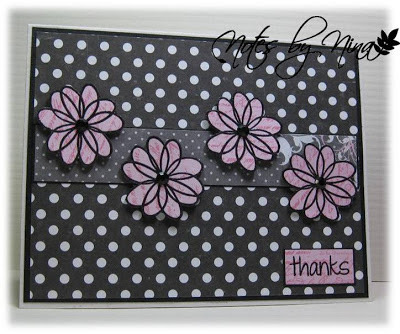 Supplies: Natural White and black cardstock, Designer Paper –Echo Park, The Stamps of Life -flower2doodle, and gems. Halloween is all done and all the stores have jumped feet first into Christmas. I love that I have all the Christmas card for this year done already. With that said, we have a new Merry Monday Challenge today to continue to build on the collection. Lesley has a new and wonderful sketch for us this week. I did not do a very good job on cutting my panels :) but it still worked out. I pulled out my Spellbinders die cuts and created a little open book, the edges are slightly inked and popped up with foam tape. I finished with some gold twine and pearls. 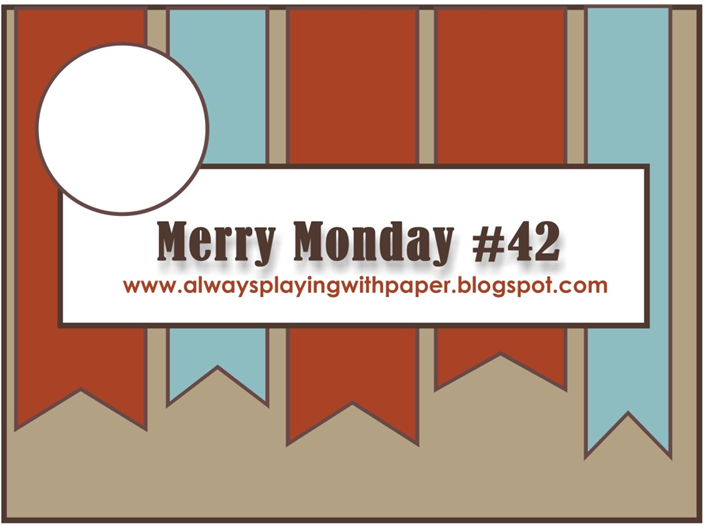 Don't forget to stop by Always Playing with Paper to leave a comment and see the design team's fantastic creations and to play along with the newest Merry Monday Challenge. Supplies: Cream and Brown cardstock, Designer Paper –Echo Park, Verve-Christmas in the Air, Spellbinders die cuts, twine and gems. A quick card this afternoon, I had a little time to craft and I needed to make this card for a friend. I kept the card relatively simple, with only a few layers. I added some pearl brads to the velvet ribbon and popped the sentiment up with foam tape. I finished with a few pearls as accents. Supplies: Cream and black cardstock, Designer Paper –Echo Park, Close to my Heart -For Every Occasion, Velvet ribbon and Recollections brads and pearls. Another week has come and gone and it is Friday again. There is a new Playing in Paradise challenge today, Jessie is our hostess this week and Happy Anniversay is the theme. I tried for simple elegance with this card, the DP is a beautiful with some areas that glimmer with glitter. I stamped my sentiment then cut it into a tag and adding additional layers. One edge is slightly popped up with foam tape. I added a silver button to the ribbon and some gems on the tag to finish. 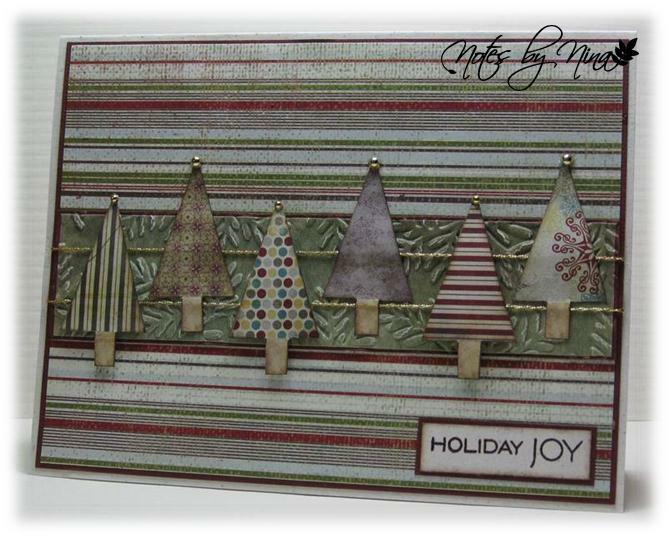 Supplies: Cream and sage cardstock, Designer Paper –K&Company, TPC – All Year Greetings, misc ribbon and button, Recollection-gems. 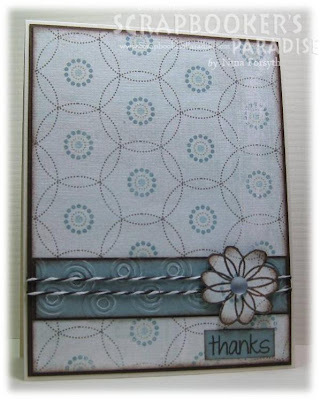 Stop by the Playing in Paradise blog, the challenge design team had some wonderful samples they have created. Don't forget to play along for a weekly prize. The house was so quiet when I got home that I could not resist sneaking in a card before everyone arrived home so I joining in the current Tuesday Morning Sketches challenge. I have been saving this paper and stamp set for no reason in particular, but it seem to all come together nicely for this card. I stamps the images using VersaFine sepia, I added some soft shading to the edges. This is double sided DP so I used the bold underside for the access piece and butterflies. The DP has beautiful bits of glitter that I tried to highlight in the photo below. 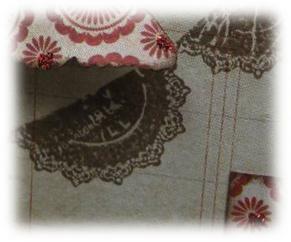 Supplies: Cream and Brown cardstock, Designer Paper –My Mind's Eye, Misc punches, My Mind's Eye-Blush Princess Stamps.